We have included selected screen shots to give a sense of the software tools provided to help get connected to the Brainfingers system, to practice Brainfinger control and to gain Brainfingers control of computer desktop and third party software. Click on the links to go to desired screen shots. The Brainfinger Access software allows you to work with multiple users. When the software is started you are presented with the window to the right. In this window the last user to run is highlighted. You can simply select Okay to run the same user again, or you can select a different user if previously entered or create a new user. You can also delete names from the list that are no longer needed by selecting "Delete Users". This window provides important information about the quality of your headband connection and signal. This window displays a moving trace of your body signal (in yellow) and a balance line (in red). If the headband connection is good and your computer is properly grounded the yellow body signal will move smoothly across the screen and touch the red balance line when you relax your facial muscles. Likewise if you were to quickly and gently move your forehead muscles up slightly for a moment you would create a "bump" in the signal as seen here towards the end of the trace. 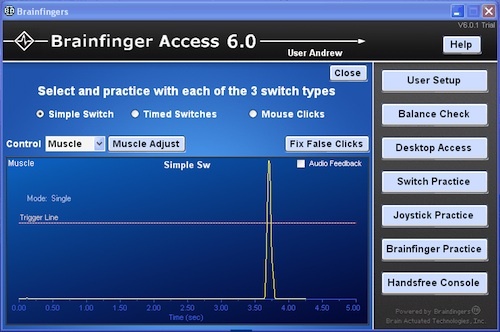 The Brainfinger software allows you to control your computer mouse buttons and all keyboard events of your computer by translating your Brainfinger actions into switches. 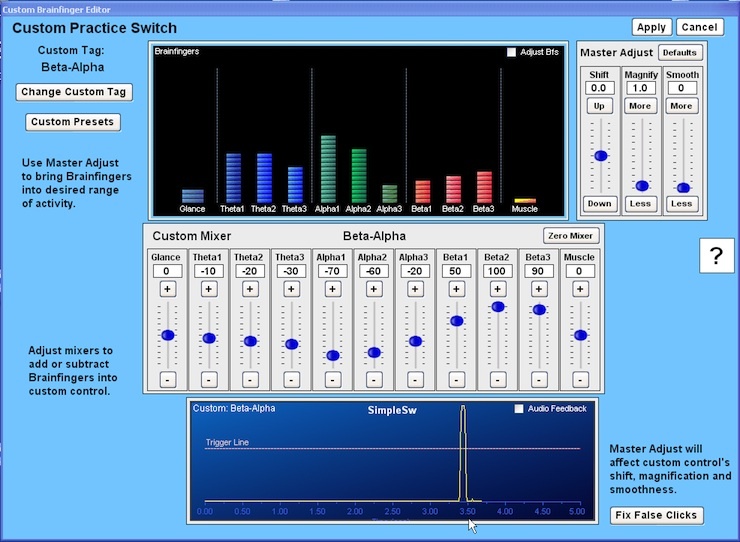 In this window a user has created a simple switch action with a Muscle control. For users who can not use their muscle Brainfinger a Custom Brainfinger can be used. In this way people with little or no facial muscle control or people with involuntary muscle activity can still achieve switch control of their computer. In addition to simple switches, it is possible to control timed switches and mouse clicks. Timed switches are created by bringing the control above the Trigger Line and holding it above for specified times. Mouse clicks are created by chaining simple switches together to create; left click, left double click etc. The software also provides ways to compensate for unintentional muscle spasms and unintentional repeated clicking in the software. The Custom Brainfinger Editor allows you to combine the core eleven Brainfinger frequency bands into a custom switch or joystick controller. Shown below is a picture of the editor being used to create a Custom Practice Switch called "Beta-Alpha." 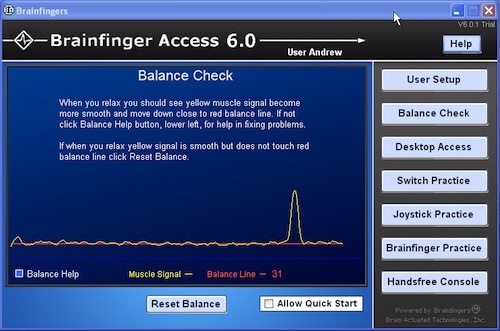 The user was able to create a quick rise and fall with the custom control, demonstrating the switch response that is possible with the core Beta Brainfinger frequency bands. The fast response of the Beta Brainfingers makes the switch useful for computer access. Creating a Custom Brainfinger involves moving the Brainfinger mixers to specify how much each of the eleven Brainfingers should contribute to create a desired custom control. For this example the Beta Brainfingers were used to positively trigger the control, thus set positive. Alpha and Theta have negative settings resulting in the custom control more easily remaining below the trigger line when there is an increase in relaxation. Changes made to the Brainfinger mixers have immediate effects on the custom Brainfinger control. In this way changes made to the mixers will be experienced by the user as they are being made. Included in the software is the Switch Game, a modification of a game we developed as part of our National Institutes of Health (NIH) study. The game was created in order to collect performance data from the study's participants and although it is quite simple to use, we found that it became a good training tool and was valuable for quantifying a user's clicking ability and performance. The goal of the game is to create a simple switch action when the target randomly appears. When a simple switch action is detected the target disappears. The response times are saved and summary statistics are given at the end of the game. 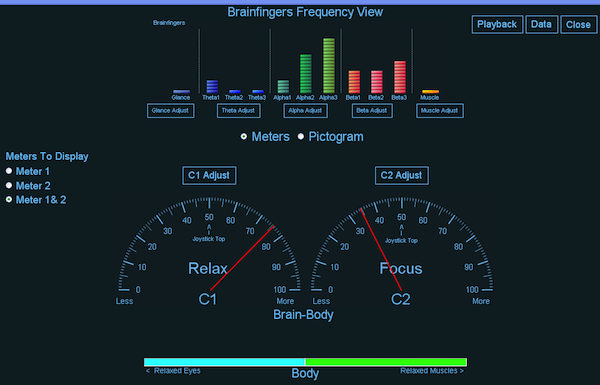 The Brainfinger Access software decodes the user's eye glance activity into left and right actions. With practice the user can bring under conscious control a left glance and a right glance action. In this window is shown what happens to the Glance signal if a user was to first glance to the left and then glance to the right. The visual information in this screen helps the user become more proficient in consciously creating the Left and Right Glance actions. Once controllable the user can use these actions as part of a matrix of control of their computer. The Grow Game is an introductory game for learning how to control Brainfinger joysticks. Note the vertical slide bar in the right side of the image. There is a small blue slide that moves up and down in the slide bar. In the image the blue slide is in the middle indicating that the user is exerting a slight amount of Muscle signal to keep the slide up. There are two zones, Z1 and Z2. When the user moves the slide into zone Z2 the circle grows bigger. When the user relaxes their control and moves the slide into zone Z1 the circle grows smaller. This provides the user with simple yet compelling feedback of their control ability. As the circle grows or shrinks musical notes are played which offers additional performance feedback. This easy-to-use training tool allows you to select either the Up Down or the Left Right axis and which Control to use; Muscle, Glance or Custom Control. Because The Grow Game gives such easy-to-understand visual and auditory feedback, it is a good learning tool for everyone; especially for people with severe disabilities. As with all of the Brainfingers software, adjustments are provided for easy adjustment of the user's signal. Some of you may remember one of the earlier computer games called Pong. We recreated the game and include it because it is such an excellent way to learn how to control a single axis. As shown in this example, the user controls one of the up/down paddles and the computer controls the other. Paddles can be placed along the left/right axis to practice controlling horizontally moving paddles. The game's; paddle size, ball size and speed, and the computer's skill level can be changed. As with all our software, adjustments are easily made through the Adjust Menus. Controls are selectable; including Muscle, Glance and Custom Brainfingers. Success in the game requires that you be able to intensify your Brainfinger to move the paddle up or to the right, depending upon what axis you are controlling, and to relax to move the paddle down or to the left. When engaged in the game the excitement of the ball coming towards your paddle tends to stimulate an emotional reaction, which adds an interesting complexity to the gaming experience. In addition, each time you successfully return the ball or the computer returns the ball, the speed of the ball increases. Thus in the face of the excitement of the game you have to learn to control the paddle while being able to stay calm in order to win. As with all the games included in the Brainfingers software, in this game the user is given the opportunity to learn necessary skills to control a cursor's up/down and left/right movement. Combining a horizontal joystick with a vertical joystick control and mapping the slider zones to cursor up/down and cursor left/right allow the user to control their desktop cursor. The Cursor Practice window provides the user with their first opportunity to experience cursor control. For this experience the cursor movement is limited to be within the Brainfingers Console window. In this example when the Glance slide is within zone Z1 the cursor moves left. Likewise when the Muscle slide in within the vertical zone Z1 the cursor moves down. When in horizontal Z2 zone the cursor moves right and when in the vertical Z2 zone the cursor moves up. For most users their Muscle Brainfinger is the control of choice, when possible, for both cursor up/down control and for mouse click control. This window provides the user with a visual feedback experience of how their muscle signal simultaneously affects both the Muscle Switch and Muscle Joystick controls. This window also provides the user with a visual feedback experience of how the cross coupling of Glance and Muscle can be mediated. The View Brainfingers window provides the user with the opportunity to view all eleven Brainfingers at the same time. In this view of the 11 Brainfingers, there are eleven light bar displays, one for each Brainfinger. The values that are displayed for each Brainfinger are the Brainfinger joystick values. An example of the view Brainfingers window is shown here. There are actually two panels, the upper panel shows the Brainfinger joystick values and the lower panel shows the brain-body signal which is the composite signal that is used to extract the glance, alpha and beta Brainfingers. The muscle joystick Brainfinger is extracted from a different component of the headband signal. For the image displayed to the left, the user reduced their brain tension as well as their eye and muscle tension, this resulted in a marked increase in their alpha and low beta Brainfingers. This game is a valuable tool for learning how to control your Brainfinger brain and body interaction. Billiards can be especially valuable for users with severe disabilities, such as for those with traumatic brain Injury as well as for those who may not appear to hear or understand instructions. This is how it works: When you start the game, a white ball appears at the left side of the screen and slowly moves horizontally to the right. The object of the game is to move each of the eleven Brainfinger balls to intersect with the white ball. When successful, the software fills in the center of the Brainfinger ball and plays a unique tone as a confirmation that the ball was hit. The eleven core Brainfinger joystick values are mapped to the eleven colored balls. Thus, if you increase glance and eye tension the left blue balls will move up. If you intensify your mental activity and your muscle activity, the right three red balls and yellow ball will move up. In most cases if you relax, all the balls will go down. As you learn to reduce facial and brain tension and embrace relaxation, it becomes possible to elevate the middle three green balls while keeping the other balls down. The Awareness App provides an opportunity to discover what it feels like to be as tension free as you can be while viewing a visual display of your brain and body state. Understanding this feeling from an internal perspective is useful for all of us, and especially useful for users wishing to use more of their brainwave instead of body component of their Brainfingers. We sense our world (strong alpha) and we think/emote and act/move in our world (strong beta). When we are only sensing we are in a more relaxed wakeful state. When we are thinking and focus, there is more activity in the motor cortex and an increase in tension. The three meters let the user experience the different states of Relaxed Wakefulness and Focused Attention. Relaxed Wakefulness comes if we release facial and glance tension. The Body meter is created as a metaphor for expanding our ground plane when we reduce body tension. Moving your minds eye to sensing, the bottom of your feet for example, to increase your sensing and decrease your thinking tension will then affect the Relax meter which is reflective of brain tension as well as body tension. The goal is to let the awareness users gain here be carried into other instances to improve the relaxation/tension continuum for control of the users Desktop and 3rd party software.. Desktop Access gives the user the ability to control 3rd party software. This is accomplished by selecting a Profile and launching onto the computer Desktop from the Brainfingers Access console window. The Profile selected is used to specify what mapping will be used between Brainfinger controls and computer events.